Put your device down for a moment and take a walk down the street with us. Look around, and pick out some details that your eyes are drawn to. 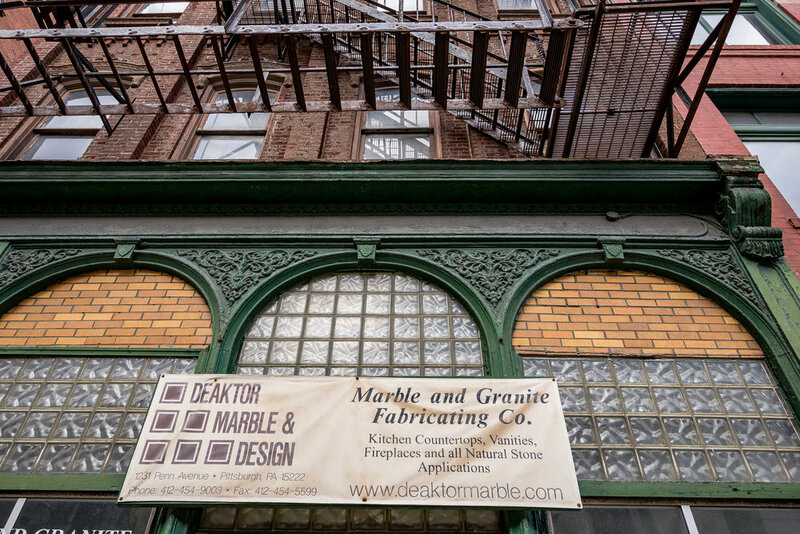 Maybe you see some buildings that have porches, arches, cornices, pillars, stained glass, maybe even a pediment. You don’t have to be a master of architectural terms to pick out what makes a building special. There’s something about rich design elements that beg for you to notice them. What makes a block special? Each and every building that comes together to form the landscape, and we may get used to seeing them there all the time. But what happens if someone comes along and takes one away? Possibly it gets rebuilt in a new style, or possibly paradise gets paved with a parking lot. What happens to our aesthetic? Do we notice, do we care? What happens if more and more of them start to disappear all over the city? 1231 Penn Avenue is not protected by a local historic designation, nor is it in a National Historic District. However, with its fine detailing and ornate elements, the building contributes to the character of that section of Penn Avenue and to the overall architectural heritage of the city. 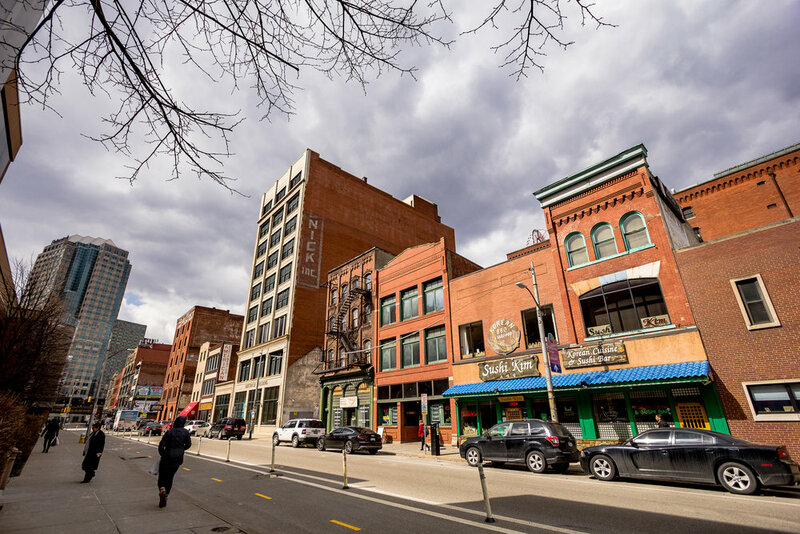 Pittsburgh, compared to other cities, has a very low number of buildings on its city historic landmark list and does not have the most stringent protections against development. Some of our most iconic buildings, like the Block House and Union Trust Building, are not designated landmarks and have no protection if ever faced with demolition or insensitive exterior renovation. Preservation Pittsburgh has been taking steps to actively nominate various buildings as local landmarks – but it is a slow process. As preservationists concerned with Pittsburgh’s architectural and historical heritage, we often hear the same rationale for demolition (not every building can be saved, an engineer’s report states that a building is not structurally sound). The main argument for demolition is often that an existing building inconveniences one’s larger development plan. Additionally, we see many buildings demolished without a clear plan in place for a new building. And it is the Heinz History Center who will demolish this significant building of stature and history. They would like to use the space for loading objects in the short term and plan a possible expansion in the long term. We know there are often options other than demolition through which an organization’s goals can be accomplished. It takes some openness and creativity. Indeed, while we support the History Center’s overall mission, we believe there are other possible workable options to consider for the property besides demolition. We are sympathetic to costs, especially for a non-profit organization such as the History Center, who was able to purchase the building recently for $585,000 according to the County records and surely realize there will be significant demolition costs. There are funding sources such as PHMC’s Keystone grants for historic preservation as well as our local funding community that could help with stabilization and rehabilitation of the building. Due to development pressures, church closings, and organizations’ continual needs for expansion, pieces of Pittsburgh are being chipped away left and right. Taken all together it adds up to a significant erosion of our shared heritage. We have seen far too many buildings demolished, some with no certain plan in place, and the time to consider alternative solutions is before the wrecking ball swings. By taking the most expedient route or not exploring other options, far too many are ignoring the "specialness" that makes Pittsburgh such a wonderful place to live and to visit. Please join us in our efforts to save what’s left of our city. We aren’t looking for people to chain themselves to buildings, just residents willing to send a message to these owners that THIS PLACE MATTERS TO ME!